The Mini Torii is a 6V6 BASED SINGLE-ENDED CLASS A dual mono amplifier. 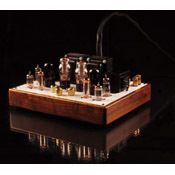 It features 6X4 tube rectified power supplies, OA3 tube voltage regulated output tube grids, OC2 tube voltage regulated input stages and dual stepped volume controls. It's a self biasing design where the 6V6 compatible equivelents are plug in compatible, the ideal platform for tube rolling. Tube life is extended and therefor inexpensive to operate.